Joseph Mullaney, a junior at Quinnipiac, experienced the joy of making it to the top of the Sleeping Giant—something that he didn’t think he’d ever be able to do. However, this feeling of joy was built not only on getting to the top, but from the people who helped him get there. Since enrolling in Quinnipiac, Mullaney always had a dream of hiking up the mountain, but due to a rare genetic disorder, it seemed like an impossible feat. Mullaney was diagnosed with Friedreich’s Ataxia, which affects one of 50,000 people worldwide. Mullaney said the disease impacts many aspects of his life, which forces him to be restricted to a wheelchair. “It is a muscular disease that affects your speech, balance, hand-eye coordination, vision and [causes] fatigue,” Mullaney said. Though the idea of going up the mountain seemed unreachable, Mullaney’s brothers in the fraternity, Sigma Phi Epsilon, were not going to let his dream perish. 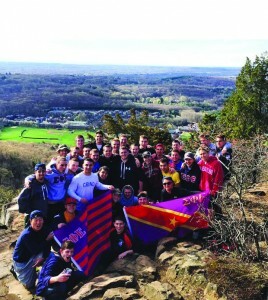 One member of the fraternity and a former roommate of Mullaney’s, Jon Nanna, created a Facebook page entitled, “Operation get Joey up the Mountain.” More than 40 members of Sigma Phi Epsilon supported the page and they devised a big surprise: a breakfast buffet. Matt Blumenthal, a member of the fraternity, said the buffet was just a distraction from the real surprise. “We told him [Mullaney] that we were going to a breakfast buffet and then from there, instead of taking him there, we all took him to the base of the Giant where we all waited for him,” Blumenthal said. The brothers had to hide their pretenses as Mullaney was secretly driven to the base of Sleeping Giant. As the brothers of Sigma Phi Epsilon surrounded Mullaney in the van, he knew something big was going on. There would be no buffet; instead the brothers were all there to help him hike the mountain. They had a strategy on how to hike as well. Every few minutes a new brother would carry Mullaney on their back as everyone ventured up the main tower path of the mountain. After they passed numerous trees and marched over dirt roads, the challenging hike reached its end. The fraternity brothers successfully made it to the top of Sleeping Giant with Mullaney by their side, taking in the picturesque landscape. Mullaney’s reaction to getting to the top and seeing the view was not what he expected. “I thought I would be very enthusiastic, but no. I was just very silent. [I] just took the day in; took the view in. It’s unreal up there,” Mullaney said. The hike up Sleeping Giant took place on May 1, 2014, before finals week. This was a gift Sigma Phi Epsilon gave to Mullaney, but it wasn’t widely recognized until the fraternity posted a video promo of the occasion on YouTube on Sept. 11, 2015. Since then, Sigma Phi Epsilon has gotten more than 24,000 views on the video and nationwide praise over their deeply benevolent actions. News channels and websites like FOX and Huffington Post have presented this story of brotherhood to the public eye. Based on how bright the present is for the brothers of Sigma Phi Epsilon, “Operation get Joey up the Mountain” is likely to occur once more in the near future. “Hopefully this happens a few more times—at least one more time. I want to see it before I graduate,” Mullaney said. Currently, Sigma Phi Epsilon is planning a 10-mile bike ride called “Ride-A-Taxia” on the Quad of the Mount Carmel campus on Sunday, Oct. 11. There will also be a large barbeque, lively music and tons of fun. The purpose of the event is to spread awareness on Friedreich’s Ataxia.